Q: How is PSV Union different from other clubs? Q:How often and What Do You Practice? Q: What are your favorite things about the club? 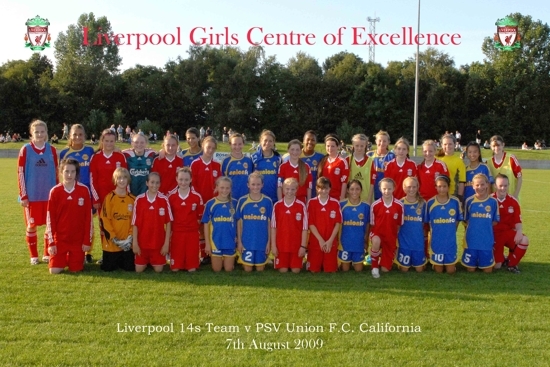 Annie Kingman, a member of our 95G team, wrote to us some years ago about her progress and development as a player at PSV Union, and her passion for soccer. Annie’s story was so impressive that it was selected to be posted on the NorCal Premier League blog "The Far Post Report" as well. It is an inspirational account of how a young player took her love for the sport, along with teaching and a good learning environment, and infused her own hard work and a lot of dedication, to rise through the ranks and become one of the most promising young talents in US youth soccer today. (Note: Since this article was written, Annie has gone on to become one of the premier players not only in Northern California but in the entire United States. 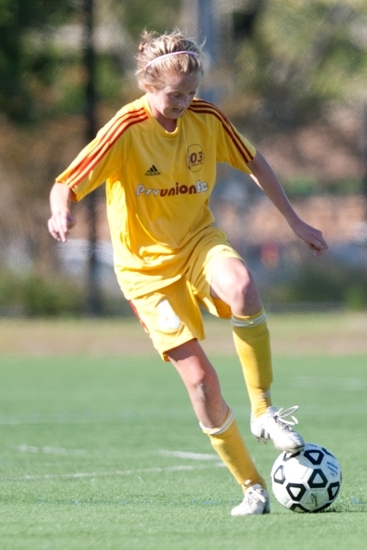 In Feb. 2012, Annie was invited to the USA U15 Girls National Team training camp with 21 other players from around the USA. Annie attened the USA U18 National team camp in Florida in October & December 2013 & will play for the USA U18 Womens National team in Spain in February 2014. Annie will play for 21 x NCAA Champions North Carolina Women's Soccer in 2014 under head coach Anson Dorrance. 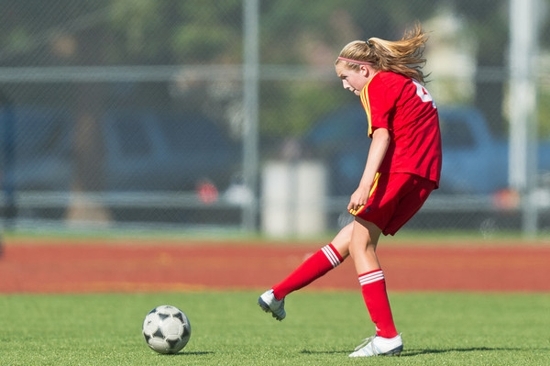 In 2013 Annie was named High School Player of the Year All-West Catholic Athletic girls soccer team by the leagues coaches. Annie was also named High School soccer Junior of the Year & was top points getter in CCS/Bay Area Total points (combination of goals and assists: 24 goals & 14 assists) Annie also now has 4,600+ juggles! Here is a story about a player who loves soccer; and who is using that love to bring her “skills and game” to new levels of excellence. It is not statistically possible that all young players can become National ranked players, but almost all young players who love soccer can – over time – become excellent players and benefit physically and socially from their involvement with such a challenging and demanding sport. 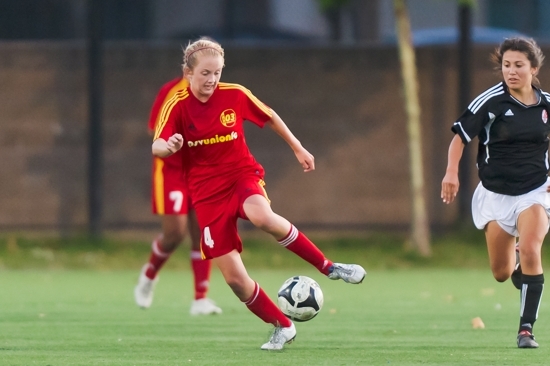 Annie Kingman has been selected as the top female soccer player for players born 1995 & 1996 in the NorCal Premier Player Development Program (PDP) during Fall of 2009. From there she was recommended to the Western Regional US Club Camp id2 Program in Texas this past November where she was also identified as being the top player in her age group. Two years ago Annie came to PSV Union as an ambitious but not remarkable player from the obscurity of a Class 3 team environment. One year ago you wouldn't have recognized the player you see today. In fact the selectors missed her at one State Tryout. We knew that over time she would improve because we were with her almost every day over the past 2 years and could see her hunger and desire to improve. Each day she seemed to return to the field an improved player. Her success story is not one of natural talent, or physical prowess but one of passion, dedication and love of the game. She simply loves to play and loves to learn! Here is Annie's story. My name is Annie Kingman. I play for PSV Union FC. My main coaches are Carine and Gary Ireland. I am also coached by other coaches in the club: Simon Ireland, Victor Ireland. I am 13 years old, and born in 1996. Currently, I play a year ‘up’ on a 1994 age team. Sometimes I guest-play up on the 1993 age team, as I play with and against them regularly in training. I also play with and against the older and younger boys’ teams often. There isn’t a day that passes where I am not playing. Right now I practice six days a week with my team, which includes small group training and specialized technical training, and whatever time I have left I am playing on my own. At practice, I work on a wide variety on things. My coaches have introduced me to countless skills: ways to strike a ball, juggling, passing techniques, ways to play, controlling a ball, crossing, finishing etc. When we don’t have enough time at practice to spend on a certain skill, I continue working on it at home on my patio, in my backyard, or at my school. I get to practice by being driven by my mom to the train station, taking the train, and from there I take my skateboard to the field. Our club has many differentiating qualities. One is the way we play. We play a passing game, but we also encourage each other to go one on one and take players on. Many of the teams we play against kick the ball way down field and have their track stars run on to it. We like to build up and combine to get forward. Another quality that makes us different is that we play up and down in age groups and with other genders. This makes you adjust the way you play. We play with and against the older, younger, and boys teams. This also helps me because the boys tend to be faster and more physical. I’ve played with the 1996, 1993, and 1994 teams, and I play regularly against the 1994 boys, occasionally the 1996 boys, and I’ve helped coach and played with the UFA kids ages 6-9. This is also helpful, because when you teach them, you learn things to improve in your own game. We train all on the same field which creates a family environment where you could pick out a player any age across the field and know their name, have coached them, played with them, or played against them. We also play everyday with our coaches. They are all amazing players themselves and have endless skill and knowledge for the game. When we play with them, we learn to position ourselves to get the ball and to combine with them. When we play against them, we learn to defend them properly, or the consequence would be losing. My coaches offer me so many challenges every day. They give me new skills to work on, juggling tricks, and so much more. Finally, our club is different because we don’t focus on tournaments. Many teams go to tournaments to be recognized, improve their “rankings”, or as some teams believe, to get better. My opinion is that tournaments don’t help you improve. How I improve is by staying after practice for an hour to shoot, play, or cross and finish with my coaches. Not by playing three to five games in one weekend. This can be too much stress on the body, while you could play one training game and learn so much more. In my club juggling is a necessary skill to have. It can improve your touch, balance, and your strike of a ball. Usually, a practice will include juggling at some point. I was 10 years old when I got 1,000 juggles. My current juggling record is 3,075, and achieved this number at age 13. I continue to work on freestyle juggling with certain restrictions as well as tricks. The reason I don’t go after higher numbers like 5,000 or more is because once you get over 1,000 or 2,000 it makes more sense to try and improve areas in which you aren’t as good. Soccer tennis also helps juggling, as juggling improves your ability to play soccer tennis. Soccer tennis is one of my favorite things. We usually play it when it is raining and we are on the courts. I like playing on the tennis courts because the ball moves faster and it challenges your first touch. I am inspired by a number of people. A few players I like are Fernando Torres, Zidane, Messi, Glen Johnson, Pirlo, and Robinho. 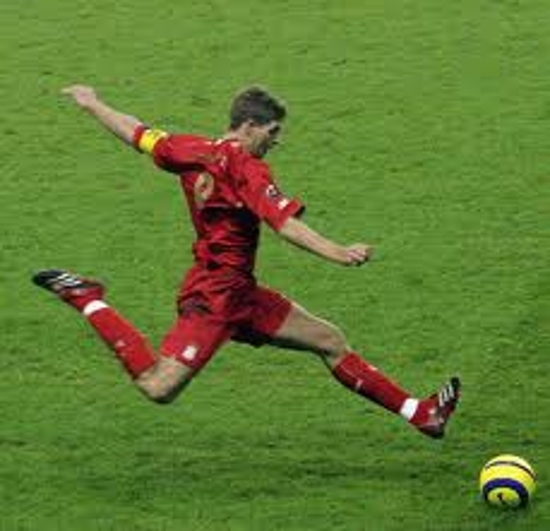 My favorite player is Steven Gerrard. His passing is amazing. The way he executes a perfect pass makes me want to go and do the same. His team, Liverpool, is also my favorite because of the way they play. They have so much heart and can pull off things thought impossible. Other people who inspire me are my coaches. I love watching them play, and their skill is endless and its makes me want to do what they do. This summer I was fortunate enough to take part in a trip to England with the club. Here we got to play several games against local teams and against each other in the public parks. We stretched every morning on the courts and worked on foot skills. We also played multiple small-sided games. The trip even included some professional games which were absolutely amazing. It was so cool to see the teams I watch on T.V., including Liverpool, Atletico Madrid, Valencia, Manchester United, Arsenal, Paris St. Germain and Glasgow Rangers. When I saw Gerrard at Anfield I could hardly breathe. I was absolutely stunned. We learned about the history of the game and the teams we hear about everyday. We saw just about everything there was to see including stadiums, guest speakers, Liverpool training academy, and all the sights in England. This trip was the best experience I’ve ever had. Another great experience I have had was meeting Marta in Los Angeles on my birthday. This was made possible by my coach, Carine. It was really cool to be on the field with her, and it made me want to be playing too. My coaches recommended me to the PDP id2 program. I played a weekend in Santa Rosa, and I was recommended from there to go to Texas. I had a ton of fun at both of these events. I learned a lot and got the chance to play with many different kinds of players. I started to improve my ability to work with different kinds of players and incorporate them into my own game. I was not recommended to the program through a tournament. I was recommended through practice and some games. My family is also very soccer oriented. My dad played with a half academic, half soccer scholarship at Bucknell University, as well as in a semi pro league. He continues to play to this day, and he was the one who got me playing soccer at age 3. My 11 year old sister, Georgia, also plays. Every weekend w e find a time to go down to my school to play, cross and finish, shoot, juggle, and pass. My grade point average is a 4.0. Since I was little, I had dreams of playing professionally and for the US National Team. These goals haven’t altered and I still have the highest ambitions to be the best player I can be. Annie Kingman was coached daily at PSV by Gary & Carine Ireland for 6 years for PSV Union 94G . She also represented the USA U15 &18 National teams. She now plays NCAA D1 soccer for the legendary 21 x NCAA Champions North Carolina Tarheels Womens Soccer coached by 7 x NCAA Coach of the Year Anson Dorrance. Read HERE for a story on Annie from several years ago. And HERE for a recent school article. What made you choose UNC? Did you have any other offers and interest? I had a few other interests, but UNC was always at the top of my list before I visited. I visited a few schools before UNC, but the second I stepped on the campus I knew that it was the place for me. Every player and coach has a huge passion for the game and it's contagious. The coaches are so inspiring and truly care about each individual player, on and off the field. How did you get noticed by UNC? Gary, Carine and Simon have always helped me keep in touch with UNC. They have had a strong relationship with the coaches there for a number of years and have trained players who have played for UNC in the past. It was on their recommendation that the UNC coaches offered me a place. Former Tarheel player and staff coach and USA WNT player Lorrie Fair was also on tee PSV staff. My coaches at PSV helped me immensely with the process by communicating with the UNC coaches about my development at PSV. Without their help I would never have been able to achieve this dream. My coaches teach me everyday about the importance of communication and this skill has helped me immensely in all aspects of my life. They’ve taught me to be proactive by being fantastic role models. Assistant Coach Chris Ducar saw me play in the Las Vegas College Showcase and forrmer UNC player and asst coach Cindy Parlow coached me at an id2 camp, and they saw me play in Sunrise, Florida for the U15 national camp. I would describe myself as a playmaking midfielder. I love to be on the ball and bring others into the rhythm of the game. I also love to shoot and to help create and score goals. I have been at PSV Union since the spring of my 6th grade year, so I have been playing here for six years. During the week we have team training on Monday, Wednesday and Friday. We have a small group training on Thursday. On the weekends we usually have one game and/or a practice. If we don't have team practice, I will train on my own. I train everyday whether it's with or without the team. In training we put a huge emphasis on technique. Every practice begins with some kind of technical work. We focus on technique because it is the foundation for other parts of the game and it must be constantly refined in order to improve. Absolutely, there are multiple players coming up through PSV. There are kids in the academy who can do thing with the ball that took me years to achieve. We have promising young players, both girls and boys, in our club at every age level. I have had countless experiences in the game but a few stand out. First was my trip to England with the club. We had the opportunity to watch Liverpool play at Anfield, which was an unforgettable experience. We also got to play other youth academy teams. The trip was an incredible learning experience and such an amazing opportunity. Second was getting to meet Marta. Carine Ireland gave me the incredible opportunity to meet her after watching her play at the Home Depot Center. It was an incredible experience. Also, my family and I travelled to Germany this summer and watched the Women's World Cup. We saw US, Mexico, and Brazil play. It was so inspiring. Finally, the USA U15 National camp in Florida was an amazing experience. The players were all so talented and I was honored to be able to train and play with them. I want to take the game as far as I possibly can. I've always dreamed of playing for the full national team one day. I also want to play professionally. I love the game and I will play for as long as I physically can. Set goals for yourself and work as hard as you can. Every moment is an opportunity to improve so always put 100% into everything you do. Watch the game on TV and touch the ball every day. My favorite player is Steven Gerrard for Liverpool. I've watched him play for years and his determination and dedication to Liverpool is inspiring. He has an amazing striking and passing ability and is relentless on the defensive side of the game. I also love to watch Messi, and I loved watching Zidane. I have had a lot of people influence me in my life. My coach, Carine Ireland, has been a tremendous role model for me during my years at PSV Union. She is someone who has achieved what I hope to achieve on the women's side of the game. She inspires me to train as hard I can and to always give 100% effort. She works harder than anyone, both on and off the field. She has presented me with countless opportunities and she cares so much for her players' development. I have learned so much from her example. How have your coaches helped you grow and develop as a player. What have you learned from them? My coaches at PSV Union have helped me improve so much. They are all high level players themselves, so we learn a ton from simply playing with and against them. They are so knowledgeable and know exactly how to help us achieve our goals. They provide us with videos and articles that help us learn about the game. Everything we do at practice is purposeful and we are constantly improving. More than anything, my coaches have so much passion for the game. This passion creates a fantastic atmosphere in our club and inspires all of us to work hard. Annie and 5-time FIFA World Player of the Year Marta at the Home Depot Center in Carson, CA after a WPS game for LA Sol, April 2009. PSV head coach Carine Ireland set this surprise visit up for Annie!